Sri Lanka has incorporated Millennium Development Goals key performance indicators in our national budget policies, President Mahinda Rajapaksa said. 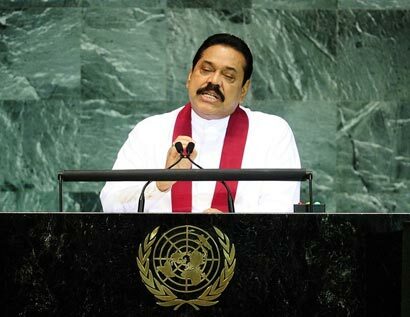 Speaking at the Summit of the Millennium Development Goals in New York, he pointed out that as a result Sri Lanka has already attained or is on track to attain the MDGs, despite formidable odds, including the almost thirty years of a violent terrorist movement and the December 2004 Indian Ocean Tsunami. “In terms of universal primary enrolment and completion, we had recorded a level of almost one hundred percent (100%) by year 2007. Gender parity in primary education has reached ninety nine percent (99%) and in secondary and tertiary enrolment, the ratio of girls to boys exceeds one hundred percent (100%),” the President said. Emphasizing the imperative need for protecting the environment, the President said, “while we strive to achieve reasonable standards in living, we must not forget the need to avoid treading heavily on the natural environment. President Rajapaksa urged the world leaders to treat this as urgent and reach consensus on curtailing global warming based on the principle of common but differentiated responsibility and the Bali Action Plan. Economic development to be sustainable, must include emphasis on protection of the environment. Green technology in industrial production is, therefore, one of the central needs of our time, President Mahinda Rajapaksa said. Equity with regard to the distribution of wealth and access to essential services, we believe, are hall-marks of long-term stability, he added. Observing that recent global economic and financial crisis has severely reduced the access to external resources and private capital flows, for developing countries, he called for a genuine commitment to fulfill donor obligations. It was a proud to achive goal 3 ” Gender equality & empower woman” 100% of Primary & scondary, Tertiary education.